The War of 1812 moved to the capital when British troops arrived in Washington on August 24, 1814, without encountering much resistance. That evening, they began the systematic destruction of all public buildings, including the White House and the Capitol. It was said that the city was swallowed in flames that could be seen miles away. Lawrence’s depiction of the Burning of Washington focuses on the violence and destruction with the canons firing against a dark, smoke-filled sky. A dash of red dripping from one of the cannons adds to the destructive nature of the scene. Off to the left corner of the panel is the corpse of a small bird, still bleeding. The only indication of what this panel is about comes from the title and the caption, which is a quote from a British soldier’s eyewitness account. This panel was completed in 1956, when the Montgomery bus boycott ended successfully. Prior to this successful conclusion, in February 1956, Martin Luther King’s house was bombed. An analogy can be made between the bombing of King’s house and the destruction of Washington in 1814. King was one of the central figures of the boycott; the bombing of his house with the intention of killing him was a certain attempt to cut off the source of inspirations and support of the African American communities to continue fighting for their rights. Depicted here is the solitary American seaman described in Henry Clay’s 1813 speech which called for action against British violation of U.S. maritime rights. Clay was a prominent War Hawk, distinguished as those who favored war with the British. In his speech, Clay declared that America must stand up for the rights of their sailors. 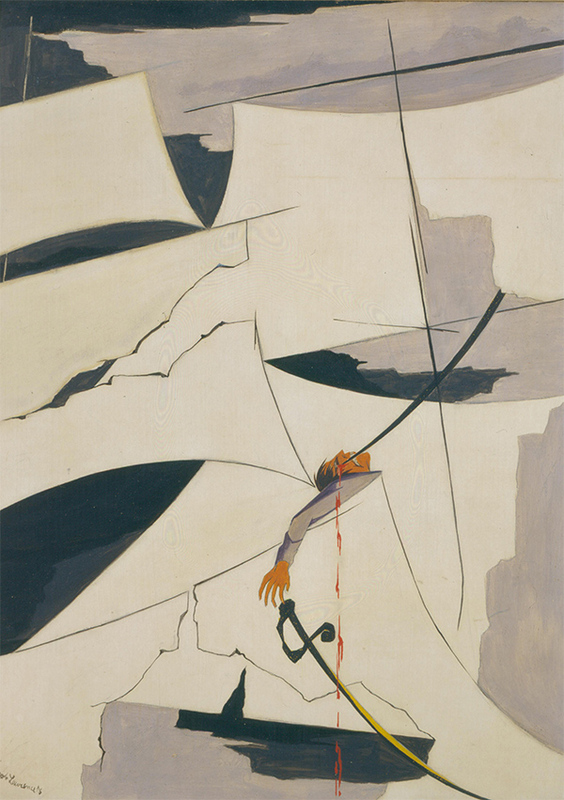 The sailor’s face reveals his excruciating death just seconds after a sword pierces his eye, as his own weapon collapses from his lifeless hand. Lawrence’s use of the part to represent the whole allows the viewer to associate the invisible assailant with the unfolding scene without having to explicitly present him. The image is accompanied by an abridged version of a quote from the full text of Henry Clay’s speech in 1813. Jacob Lawrence chose this particular quote to complement the dramatic image because it emphasizes that the “one common struggle,” even though it may be from different times and for different people, calls for sacrifice and dedication in the same way. 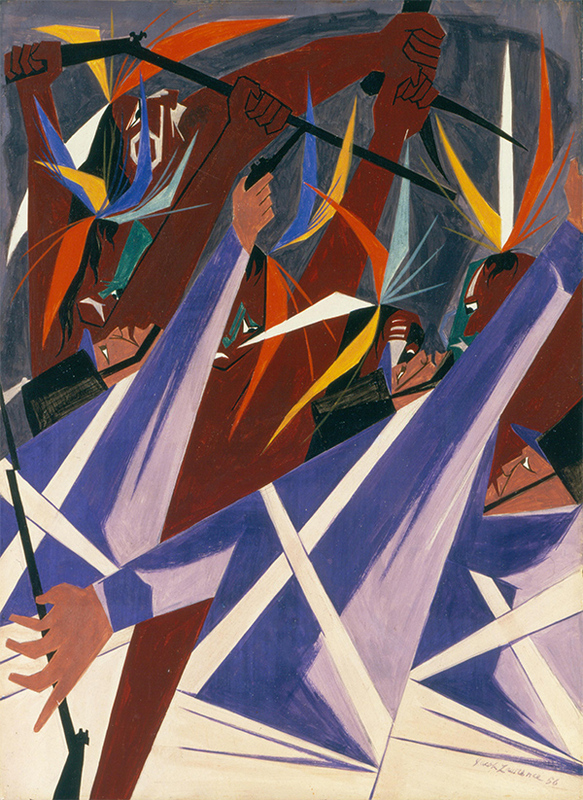 In this image, Jacob Lawrence illustrates one of many battle scenes between Native Americans, who allied with the British, and American soldiers before and during the War of 1812. The accompanying text is an excerpt from a speech given by Tecumseh to his British ally Major General Henry Proctor. Tecumseh was demanding in his convictions that their united forces should continue to fight instead of withdrawing as Proctor intended to do. Lawrence misrepresented this quote as being spoken at the Battle of Tippecanoe in 1811, and it is unclear whether this decision was made on purpose or not. Leading up to the Battle of Tippecanoe, Tecumseh worked towards uniting the various native tribes into a collective group that could make decisions about the ownership of the remaining native lands. The message is clear in both instances that Tecumseh sought to unite his fellow Native Americans and fight for their right to own western land. 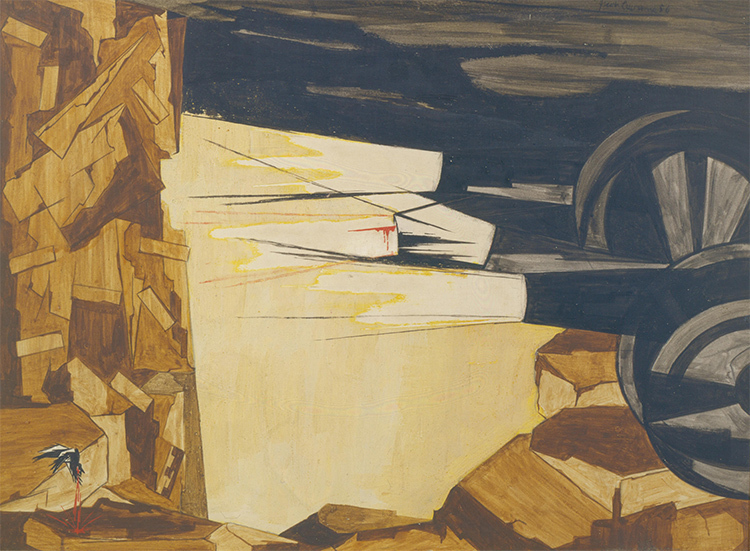 The scene is violent, depicted through the harsh upward stretching lines, arm, and weapons. The chaos of the event is dramatized by lack of back drop and landscape, suggesting that the masses were struggling and intertwined so closely that nothing else was visible. The color pallete is dark, with the Native Americans remaining more vibrant, perhaps to represent the passion of the protagonist. Lawrence wants us to not only see but also feel the persistence of the Native American.